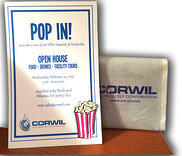 Thank you to all of our customers, colleagues and friends who attended our Open House on Wednesday! Visitors were able to take a tour of our newly combined assembly and test facility. The 'under one roof' location allows CORWIL to efficiently take a customer’s device from the beginning, wafer probe, to wafer prep and package assembly, perform package final test, then scan/bake/tape & reel, and into FGI or direct ship to the final end destination. If you were not able to stop by, please give your sales rep a call and schedule a tour. 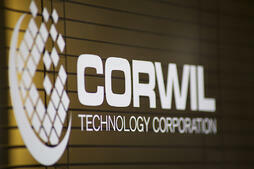 You can also take a look at what CORWIL Technology can offer by checking out our video. Milpitas, CA, December 18, 2014 - CORWIL Technology now offers assembly and test services to their customers all under one roof. CORWIL announces the completion of the CORWIL Test Division (CTD) move from their Santa Clara location to the newly remodeled CORWIL facility located at 1635 McCarthy Boulevard, Milpitas, CA. The building redesign includes the addition of 21,500 sq ft to house the CTD equipment which includes ATE such as Teradyne UltraFlex and Advantest 93K, Seiko Epson Handlers, Accretech & TEL Wafer Probers, Burn-in testing equipment and End-of-Line equipment such as scan, laser mark, tape and reel. Earlier this month, CORWIL's own Jonny Corrao, Engineering Manager, presented 'Die-Prep Considerations for IC Device Applications,' at the October MEPTEC Luncheon at the Biltmore Hotel in Santa Clara, CA. Thank you for coming for all of those who attended. If you weren't able to make the luncheon please download the presentation below. Final thickness, surface finish, edge & backside quality, application demands… one wafer, yet endless combinations of process options when working to achieve the highest quality dice possible, prior to IC assembly. This presentation explores various device applications, with consideration to technology node, wafer size, wafer material(s), interconnect, reliability criteria, packing method, and assembly requirements, in concert with die-prep disciplines spanning wafer thinning, singulation, die-sort (pick & place or “plating”), and inspection methods.